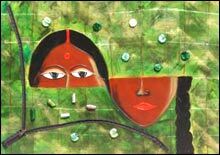 Exhibition Of Paintings By Manisha Gawade is an event that took place between 11-Apr-2007 and 25-Apr-2007 in Hyderabad. Relationships cutting across gender lines are the focus of this series. You have to now read between the lines. An exhibition of paintings by Manisha Gawade is being inaugurated by Swati Sucharita, Features Editor of Femina, on 11th April, at the Kalahita Art Foundation. The exhibition, titled Parallel Realities, showcases 9 paintings by the artist. Relationships cutting across gender lines are the focus of this series of Manisha Gawade. In a world where same gender bonding is no longer taboo, she explores the multi-dimensional layers of such interactions with delicate sensitivity. Her perspective is charmingly rooted in the Indian tradition and completely global in its outreach. In the Indian ethos, where women - perhaps for societal reasons - have forged bonds far more easily, and have often played the role of the alter ego to each other, this may come as no surprise. And simultaneously, men have bonded equally, unself-consciously enough not to earn the epithets of swinging the other way. The innate strength within the confines of fragility are indicative of the feminine supremacy as Manisha delves deep into the conundrum of relationships. Manisha Gawade is a trans­national who has been trained in various forms of painting including glass, ceramic and textiles in several parts of the world as a matter of choice. And yet she refuses to be bound by the mere grammar of surfaces and styles to reach out and explore a form that is hers alone. She transcends the regional to bring to her work the horizon of a truly international citizen, and yet there is a whiff of the Indian ethos — not self-consciously, but simply and naturally. Her work pulsates with energy that is the life blood of her chosen medium. She's an extensive traveller, and the multiple experiences from her journeys come through in her work as it resounds with hues that are awash with the dazzle of the desert and the pinnacle of the mountains. The exhibition will be on till 25th April. For further details, please contact the art gallery at 2335-0543. Be the first to comment on Exhibition Of Paintings By Manisha Gawade! Just use the simple form below. fullhyd.com has 700,000+ monthly visits. Tell Hyderabad what you feel about Exhibition Of Paintings By Manisha Gawade!